It is critically important to us that you choose the correct set makeup of Sterling Irons® for your swing speed and for your playing ability. It is no good to us or to the golfer to have irons in their set that they cannot hit well enough to have them be a part of your set. This chart will help you decide which set makeup is going to be best for your game. 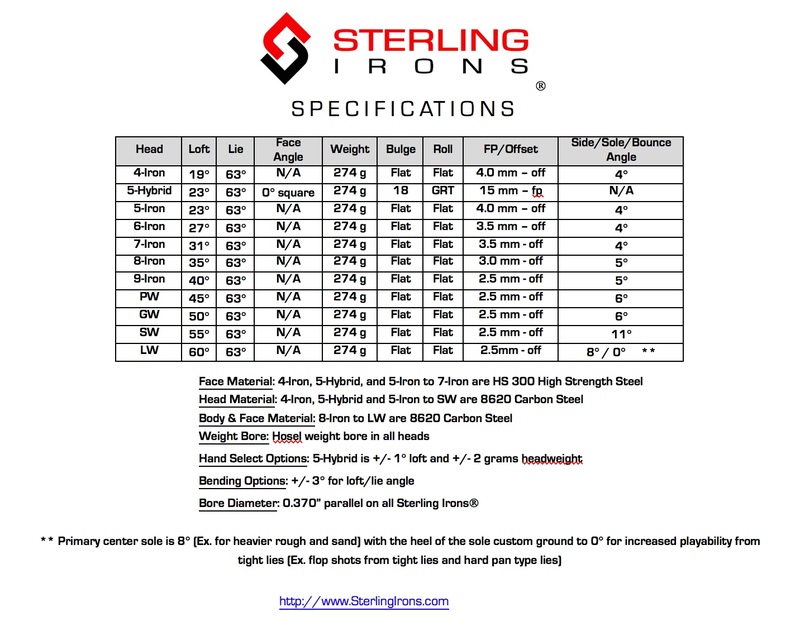 As always if you have questions of any nature about the Sterling Irons® or about any element of golf club technology, we welcome your questions and we are always glad to help with the best information. An accurate 7-iron clubhead speed is preferable to the carry distance as a data point for set makeup selection. Note: The Angle of Attack also affects the set makeup selection. The more steep/downward your Angle of Attack of the club coming into impact, the more difficult you will find it to elevate the shot high to fly and carry. If you are more steep than a -3* Angle of Attack as read by TrackMan or FlightScope, subtract 5 yds from the entries in the current 7 iron carry distance to obtain your recommended set makeup.